Puerto Princesa Underground river. Also previously known as the St. Paul subteranean river. It is also a UNESCO World Heritage Site. This eco tour has become so popular that the Bureau of Tourism is recommending that people book as far in advance as possible. The tourism office recommends the earlier the better, as the waves begin to increase as the day goes on. We started at 7A.M. We took a van and arrived from Puerto Princesa a little over an hour and a half later to the town of Sabang. You can buy the tour at any hotel with a certified booking agent. Or click here for a list. Check out reviews for the Underground river on Trip Advisor. worth taking shots of as well. 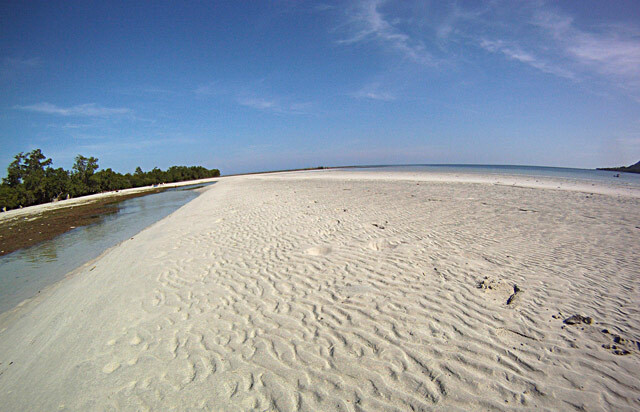 Once you hit the beach there is a short walk along wooden planks that were confiscated from illegal loggers. Then you get to the next cove. 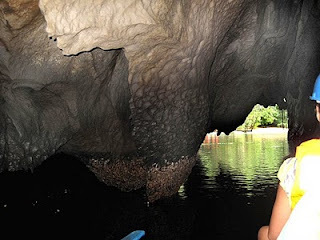 There is a waiting shed out of the sun when you wait your turn to get into a small hand paddle canoe into the river itself, as motorized boats would destroy the natural formations inside the cave. The whole tour inside the river is about 45 minutes round trip. There is much more of the river, but the portion not shown is off limits as specialized equipment is needed, as well as special permission. Everyone is handed a hard hat helmet and a life vest for safety, and one person in the ground is handed a large flash light. Once inside the cave, the darkness without the light is total. The guide then tells the person with the light to point to the most important mineral formations and most of the guides have some sort of funny story to tell. The formations are truly breathtaking. 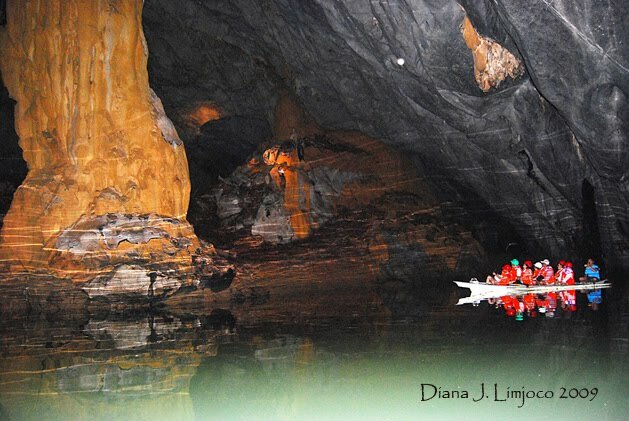 The river, which runs under the limestone mountains you pass on the way to it is over 8 kilometers long. The underground river has been nominated as one of the New 7 Wonders of the World. 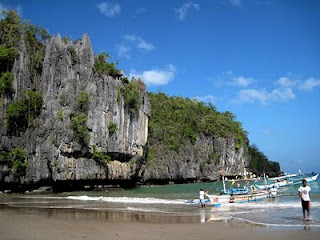 I highly recommend this tour if you get to Puerto Princesa, Palawan. We have been to it twice, and each time we go, we see something new! 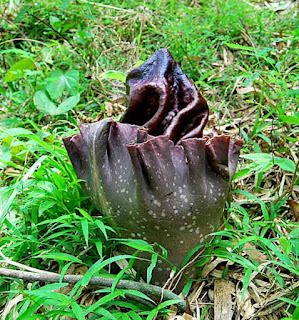 "Welcome to PPSRNP by Edward Hagedorn on Jun.17, 2009, under PPSRNP. 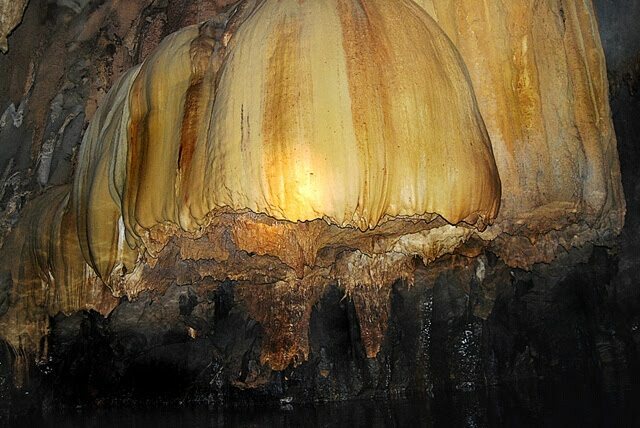 The Puerto Princesa Subterranean River National Park (PPSRNP) is one of the most distinguished biodiversity conservation areas of the Philippines. It is known for scenic natural beauty, intact old growth tropical rainforest, interesting wildlife, pristine white sand beaches and a spectacular limestone formation that possess a most impressive cave system. 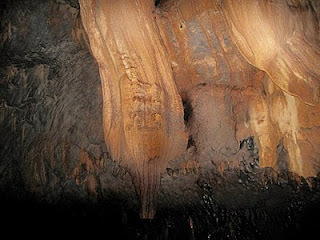 The main focus of the PPSRNP is an 8.2 km long underground river that is reputed to be the longest navigable underground river in the World. 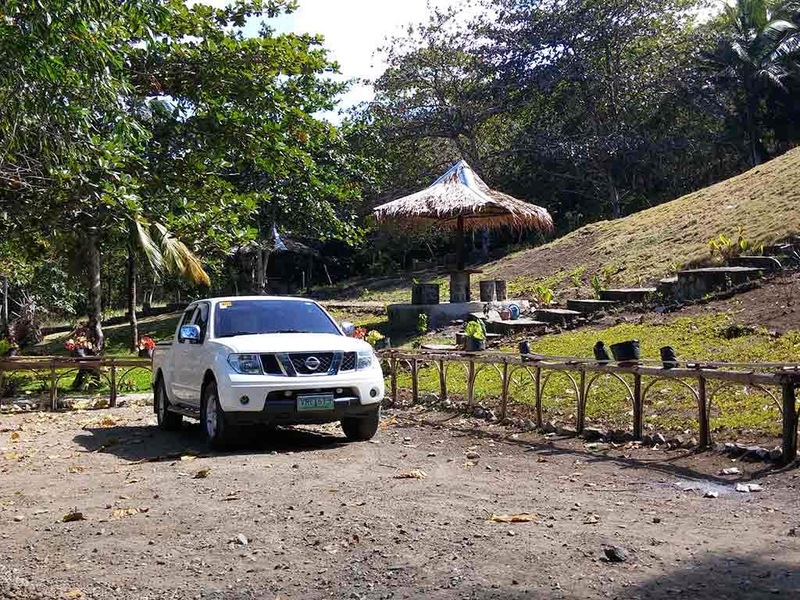 The PPSRNP is currently managed by the City Government of Puerto Princesa on a program centered on environmental conservation and sustainable development. It has the distinction of being the first national park devolved and successfully managed by a Local Government Unit. 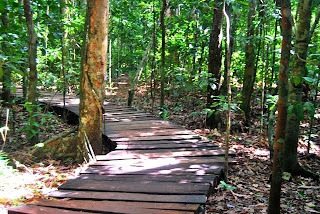 It has been cited as an example of best practices for biodiversity conservation and sustainable tourism. 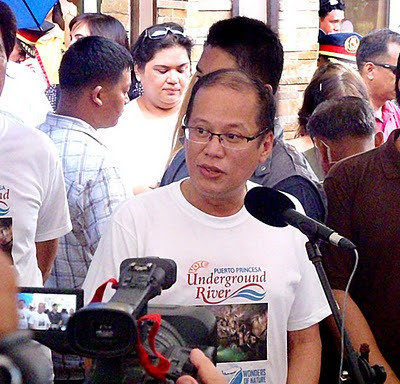 *Filipino Senior Citizens 60 yr. old and up, minors 12 years old and below, & the handicapped are exempted from paying for the Underground River Tour. 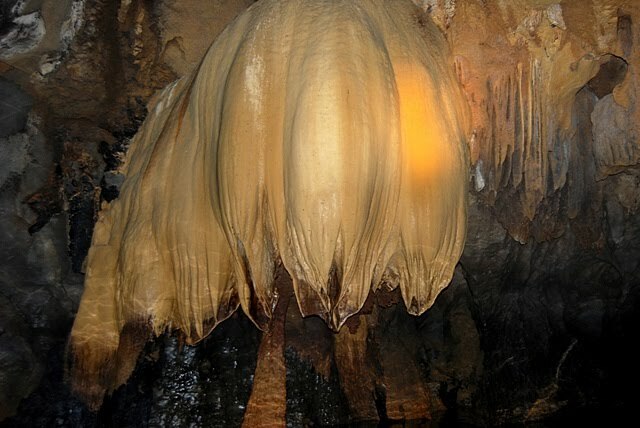 *minors two years old and below are not allowed inside the Cave. Includes van- round trip, Underground River tour and permits, boat ride, lunch and other things depending on the tour operator. You will be with other random persons and this is a full day tour. Most of the reputable hotels have tour packages. There are many tour agencies on Rizal Avenue near the airport as well. They call this formation the mushroom, for obvious reasons. 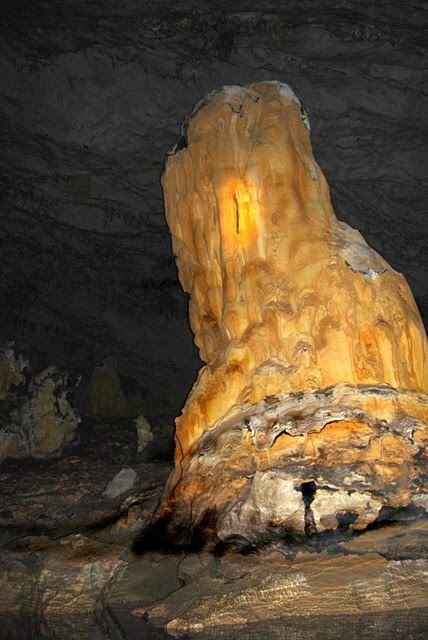 This stalagmite is over 60 feet high! 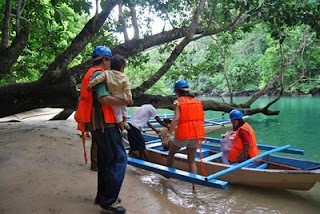 Here is a video I took at the entrance to the Underground River in the small outrigger paddle canoe. Congratulations on the post! I am a Brazilian professor and I am writing a book about world heritage sites, to be plubished by Springer. 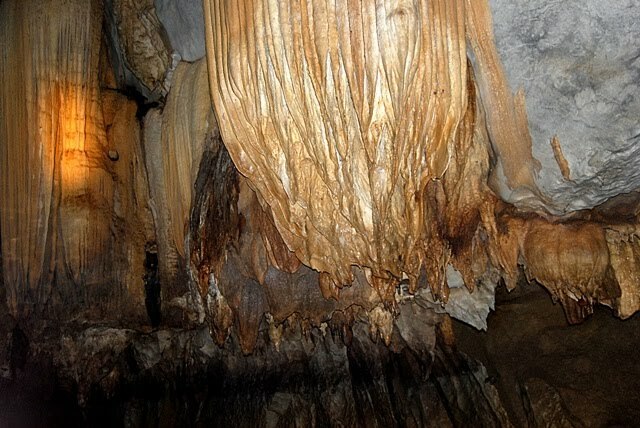 I saw these pictures of Puerto Princesa Underground River and I am coming to ask you about the possibility of using some of them to illustrate my book. All the credits would be given.